A vintage advertorial announcing “what’s new” to ladies who read Modern Woman magazine (volume 17 number 1, 1948). 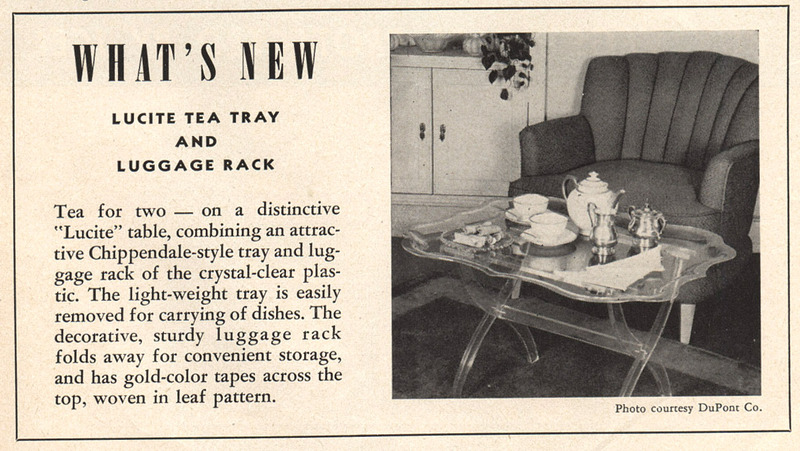 In this case, “what’s new” was a Lucite tea tray and luggage rack. Since the photo was courtesy of DuPont, I assume it was a DuPont piece. Tea for two — on a distinctive “Lucite” table, combining an attractive Chippendale-style tray and luggage rack of the crystal-clear plastic. The light-weight tray is easily removed for carrying dishes. The decorative, sturdy luggage rack folds away for convenient storage, and has gold-color tapes across the top, woven in a leaf pattern. It sure sounds like what we call a TV tray today.